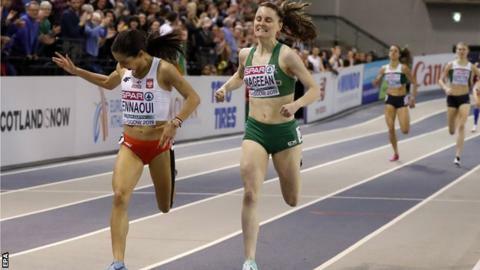 Portaferry's Ciara Mageean and Donegal athlete Mark English secured bronze medals at the European Indoor Championships in Glasgow. Mageean was pipped to second place as she clocked 4:09.43 in the women's 1500m, which was won by Great Britain's Laura Muir in 4:05.92. Poland's Sofia Ennaoui edged out Mageean to take the silver medal. Letterkenny man English crossed the line in a time of 1:47.39 to win bronze in the men's 800m. English, who won silver in the event in 2015, crossed the line in a time of 1:47.39. He finished behind winner Alvaro de Arriba of Spain (1:46.83) and Britain's Jamie Webb (1:47.13) in Sunday's race. The 25-year-old qualified for the final through an appeal after he was impeded by GB's Guy Learmouth in the semi-final. English successfully appealed the incident, which took place during the third of four laps. Scottish runner Muir was never threatened as cruised to gold while Mageean was just beaten on the line for silver by Ennaoui after the two athletes had broken clear of the rest of the field with two laps to go. Mageean said: " I'm absolutely delighted, over the moon. To be able to come here and show off the form I've been in and walk away with a medal, you can't be any more happy than that. "I'm disappointed that its not silver but I'm walking away with my head held high and I'm going to enjoy the celebration. "Laura (Muir) is obviously a class act and in a league of her own right now in athletics so I take my hat off to her, she is absolutely brilliant and its fantastic to see and it gives the rest of us something to aim for." Mageean previously won bronze at the European outdoors in 2016 and was fourth last year.